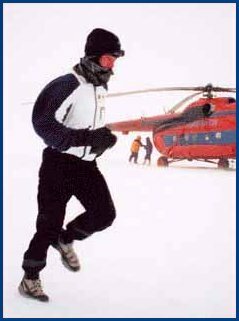 The North Pole Marathon is the world’s most extreme marathon! 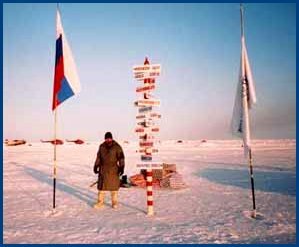 A few hardy runners race 26.2 miles (42 km) at the exact Geographic North Pole - at the Top of the World. The marathon is run on the frozen Arctic ice floes with only about 14 feet of ice separating the runners from 12,000 feet (3650 meters) of icy Arctic Ocean. This is the only marathon race in the world that is not on any land. The marathon took place on April 17, 2003. Running was very difficult over soft and loose snow and in temperatures with a wind chill of -29°C (-21°F). Martin Tighe of the United Kingdom was the winner with a time of 5.02.10. Richard Donovan of Ireland took second place and Dave Kanners of the USA came in third. At different times during this extreme race, competitors were temporarily withdrawn to be treated for frost damage to their noses. There was no serious frostbite, and all runners continued. As the marathoners struggled over the ice, through the snow and against the biting cold, a support helicopter stood by - constantly heating its engines while waiting for them to finish. The running times were much slower than a regular marathon because of the very difficult terrain and biting wind (For comparison, this year's Boston Marathon winner had a time of 2:10:11) and the extended time resulted in a fuel shortage problem for the chopper. Therefore, after the first runners finished the course, the distances of the others were marked and they were flown back to base camp - where they finished running the required distances. Luckily, no matter how long the race took, the runners would not run out of daylight. On race day at the North Pole the sun was shining all day, and it would not set for another 159 days!